Last week, I arrived back at work from a lunchtime errand to discover surfaces everywhere topped with clear plastic take-out containers. In each container was a bunch of milkweed leaves and a caterpillar. Accompanying each was a handout, introducing the creature inside as an incipient butterfly. I’ve never watched a caterpillar turn into a butterfly, so I was fascinated to have this opportunity placed in front of me. The first thing I learned is that caterpillars poop a lot. Seriously, they were productive little things. For a day or so, I watched them eat away at the milkweed, filling their containers with caterpillar “mulch”. Then I got used to their presence, busy with other things, and didn’t notice when a change took place. Suddenly, there were no caterpillars, just bright green pods hanging from the tops of each plastic container – they had become chrysalises while I wasn’t looking. Each chrysalis started out bright green with a small line of metallic-looking gold dots across it (which I will come back to later). By this point, I was determined not to miss the remaining steps of caterpillar-to-butterfly transformation. I checked on them throughout the days, finally noticing that their color was changing. 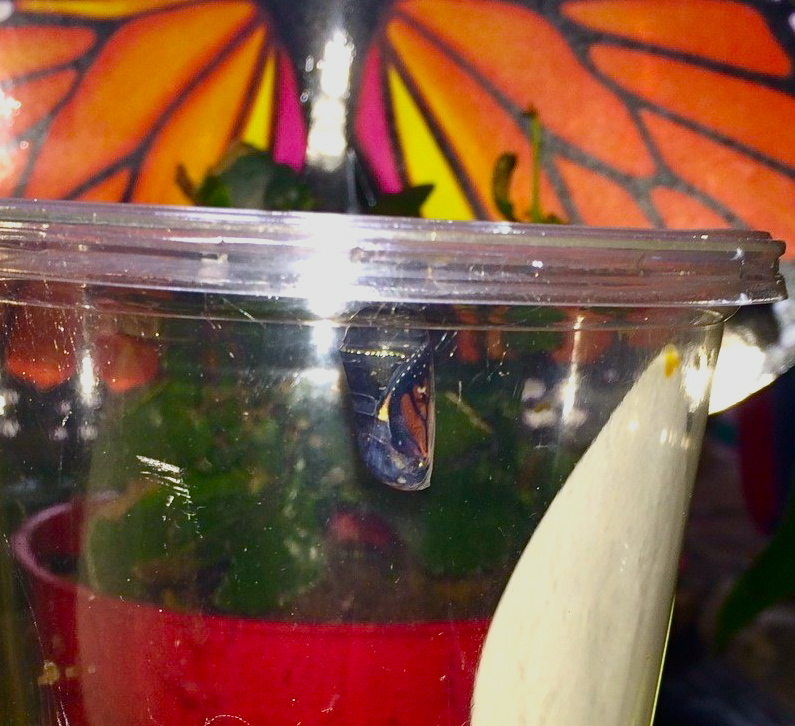 At first, it appeared that the chrysalis was turning black, but over time (and upon closer inspection) I began to see the colors of the butterfly emerge within the clear casing of the chrysalis. Many people have rhapsodized about the transformation of caterpillars to butterflies. It is an image that has been used as metaphor many times, and watching the process is endlessly fascinating. I can’t even begin to speak about it as beautifully as so many others already have. But what I loved about watching this transformation was knowing that the seeds of evolution were inside the wriggly caterpillar all along. Within each of us resides the seeds of what we can become – and we can literally change our form (transform) from within. What we have the potential to be is radically different from who we already are. Remember that line of metallic dots on the green chrysalis? (If you look closely at the photos above, you can see the dots in both.) They intrigued me, so I did a little research and discovered this: they are a mystery. Science has not yet explained them. I take great pleasure in knowing this. We can transform our lives, our very sense of who we are – that potential, that incipience, exists within us. But there’s mystery in us, too. The beautiful, shining mystery of creation that defies human understanding. This past week, everyone who stopped to look at, discuss, celebrate, and set free our butterflies noted not only the incredible biology of the process, but also the deep mystery. And we all shared, if briefly, in the joy of transformation. I can’t hold on to those moments, but I want very much to remember them. Especially at those times when I begin to feel, “This is it. I am finished becoming. I’m set now in this form, in this way of being in the world and in my own body, heart, soul.” Because those moments are the ones when I need my own imagination (my imaginal cells, if you will) to kick in. That is when I need to remember the joy – and the beauty – that is activated with the conscious choice to change and grow. ← You are not an imposter. Your inner voice is a jerk. I have a patch of milkweed growing in my backyard, and have been blessed to see the transformation in various stages throughout this summer. 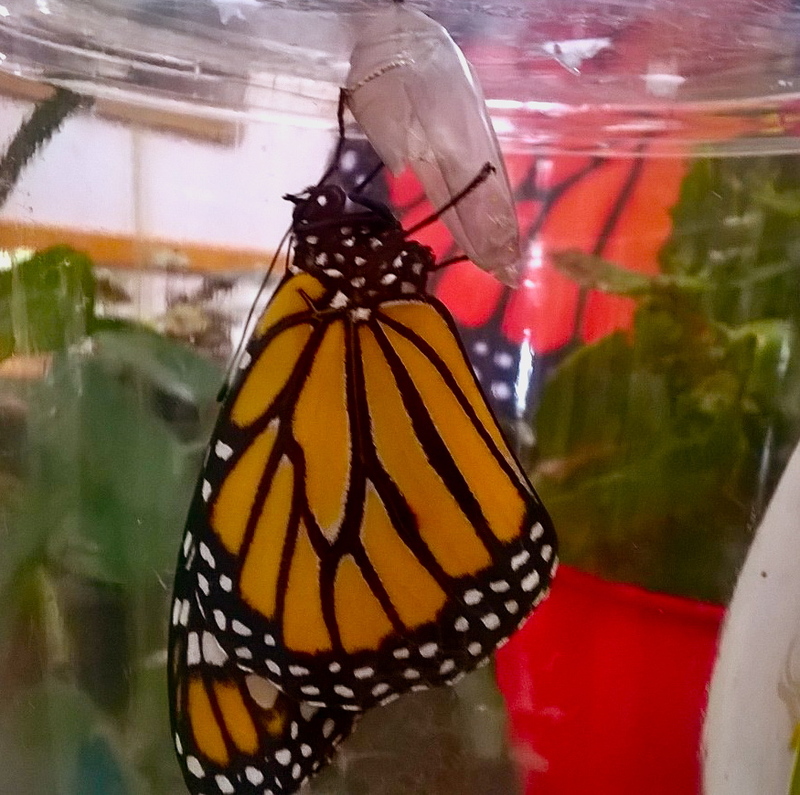 When I see a beautiful monarch flit away, it reminds me of my own transformation through the years. Monarch butterflies. They undertake a miraculous yearly migration to Mexico.